Dragon / Tiger is a typically Asian game, based entirely on an external locus of control, and difficult to grasp for Western gamblers, brought up to look for any tiny percentage advantage on the house edge. The game can be thought of as a symbolic 'battle' between the two forces of Yin and Yang - Yin is represented by the Tiger and Yang by the Dragon (this is explained more fully in this excellent article). But really it's just about the dealer turning over two cards and the highest one wins! 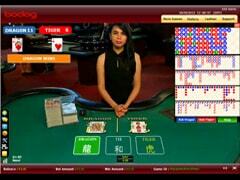 As you might expect, the game is only offered by those casinos that feature Asian feeds. And as you might also expect, this Asian focus means that the amount of money players are allowed to spend on such a simple game is astonishingly high - an incredible £10,000 at Happy8 which offers a number of intriguing versions of the game, including 3d, 2d, Multi Player and the fascinating 7 up. 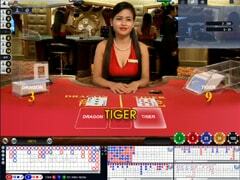 Eagle Club, our Asian HoGaming casino, offers table limits of £5,000 whilst Bodog88 Live allows bets up to £2,000. Both Bodog casinos also offer version of Grand Dragon / Tiger. Unlike the other games in our Casino games guide, there are no complex rules to learn, no strategy to study. Playing Dragon / Tiger really is about putting your gambling in the hands of fate and seeing whether Fortune is smiling on you - or not! 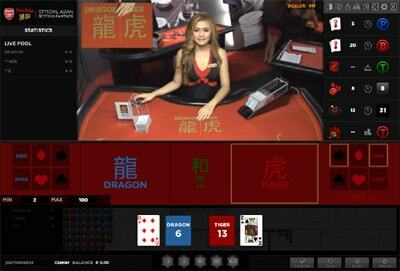 With a variety of versions and high stakes available, Happy8 provides the best live Dragon/Tiger experience on the net. High stakes and fast action are the main components of the highly recommended version of live Dragon/Tiger provided by Eagle Club. Grand Dragon/Tiger at Bodog88 is a slick, rapid action and large betting experience.